I’ve been in the process of building an electric guitar (a Les Paul copy), for, well, do I have to really tell you how long?? Ok, something like two years! Ok, ok, I said it. All right, let me see if I can get myself back on topic. Currently, I’ve been working to create the cavities where the two pickups sit into the body of the guitar. 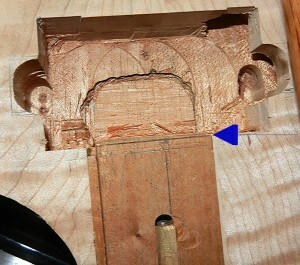 Most of it is fairly straightforward, as in marking out where I want each pickup to live. Also, I initially drilled out the majority of the waste wood, and followed it up with my router and a pattern maker’s bit. Unfortunately, there was one more piece to the puzzle with this build, relating to making the cavities complete. 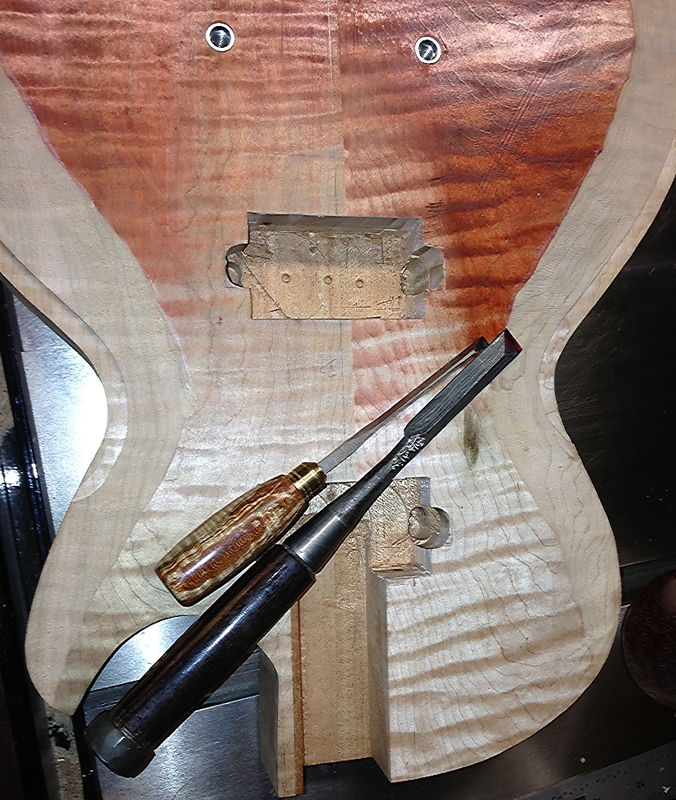 There are basically two different styles of Les Paul designs. 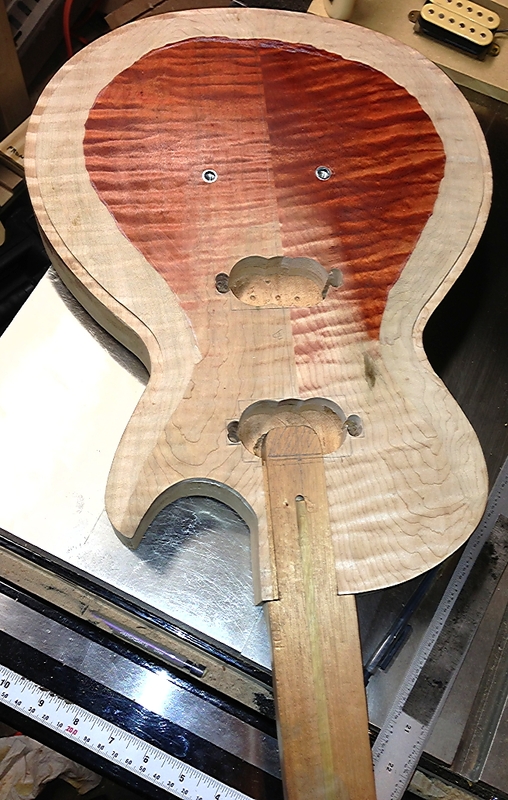 The first has a short tenon on the end of the neck that is glued into the body, and doesn’t interfere with anything else in the build. 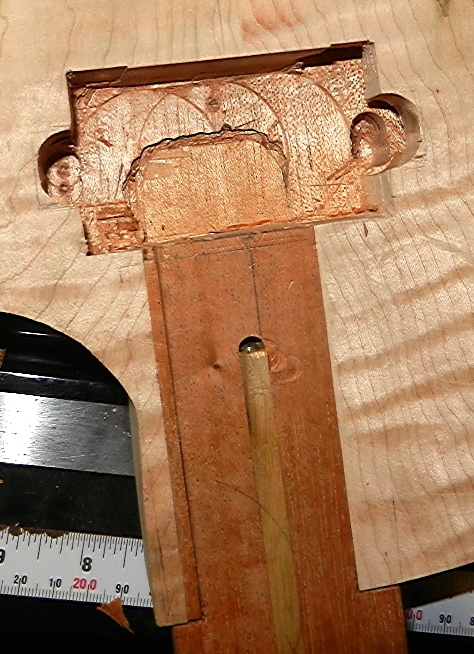 The second design has a longer tenon, and it actually crosses paths with the neck pickup cavity. 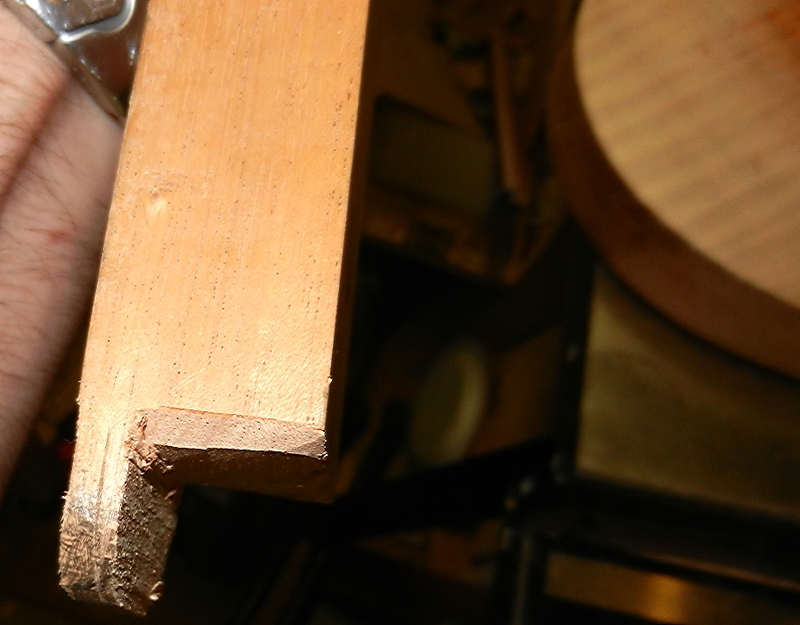 So, even though I’d completely routed the body for the neck pickup, I still had to remove the wood from the neck tenon that would otherwise block a good majority of that same space. 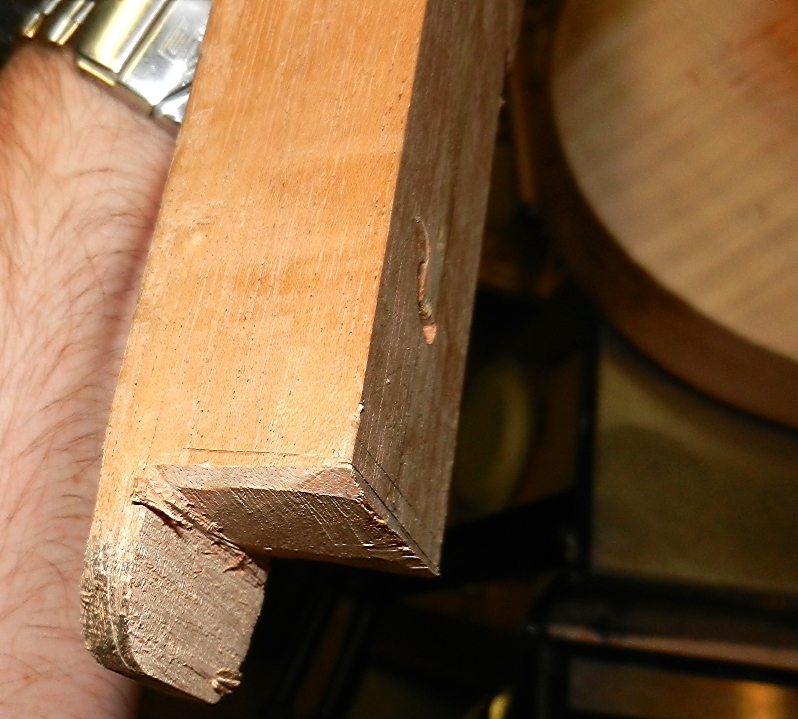 I’m not yet to the point where I want to glue in my neck, so I went about removing the excess wood from the neck tenon, using hand tools rather than just routing it at the same time as the body. I started out by marking a basic area I wanted to remove. I didn’t want to try to hit the perfect mark on the first try. So, I sawed out the material that got me to a much closer fit, but still had to finalize to a perfect fit. After placing the neck tenon back into the body, I used a metal ruler across the neck, lining up exactly where I wanted the tenon to end. Using a sharp knife, I lightly scored across the grain, for about three or four light passes. 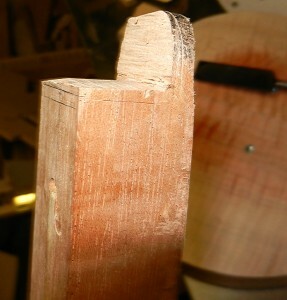 After this, I marked up both sides of the neck’s tenon, using the previously routed walls as guides. Rather than pulling out a saw, I thought I’d use one of my paring chisels to fit this section. I start out by taking some material off of both corners, taking multiple passes, until I was down very close to my knife lines on the sides of the tenon. 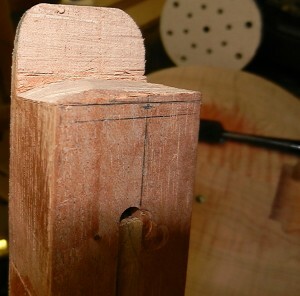 Since the lower section of the tenon remains full length, I did the same procedure from the two sides, and the front (top) of the tenon. 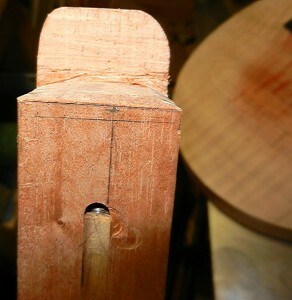 After sneaking up on the knife lines, the raised section between these lines is pared away. I have a Japanese chisel that is extremely sharp that I used for this process. It holds an edge almost forever, and has some size to it, so it’s easy to control. Just remember to take it methodically. This isn’t the type of operation where you want to rush it, or you’ll likely create a problem. Please let me know if you have any questions relating to this process.